There’s more dignity, justice and food security for all thanks to our generous community and the successful 2018 Community-Wide Food Drive. 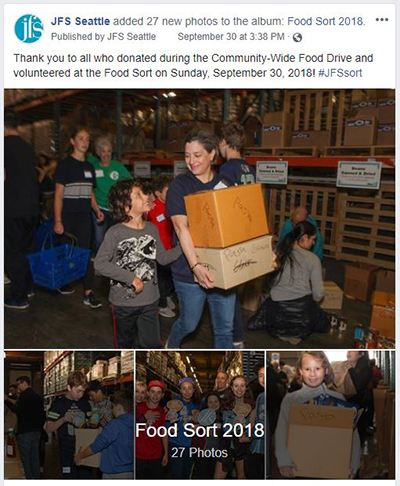 263 volunteers and staff sorted, boxed and organized about 2,050 grocery bags of food and toiletries during the culminating Food Sort on September 30. Donations will help feed and support about 1,300 households who turn to the JFS Polack Food Bank each month. Food Bank services include an onsite consumer-choice experience; a monthly Kosher Food Bank; cooking classes for low-income individuals; customized grocery delivery to homebound elders and people with disabilities; and, a monthly Eastside Food Bank for seniors who emigrated from the former Soviet Union. The annual Food Drive and community support throughout the year help JFS continue its work with military veterans and other students at Seattle Central College (SCC) who may not have food security. The JFS food pantry at SCC is now in its second year helping people like Tiffany, a single-mother who served army tours of duty in Afghanistan and Iraq and is currently working toward her nursing degree. When you support the Food Bank throughout the year, we work together toward the goals of dignity, justice and food security for all. Continue to advocate for food security — and, get a young person in your life involved in food security with this comic adventure.